Combining present-day observations with stories of the past, Lisa Mason's Big Life Lessons From That Still, Small Voice takes readers on an honest, sometimes heartbreaking, journey. 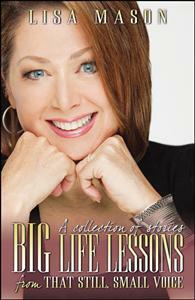 Lisa Mason, an Emmy award-winning host and writer, has published her new book with Infinity Publishing. As a host for the QVC Shopping network, Lisa is seen in nearly 90 million homes across the nation and has interviewed such celebrities as Barbara Walters and Hugh Downs.